Presentation: Ideal for beginner riders or families with older children. The tour is accessible to all cyclists and is a perfect combination of riding and visiting. Transfer from Pisa airport to hotel. Your day is free to explore the town and especially to pay a visit to the famous leaning tower! You can start with a gentle flat ride following the river or by attacking the climbs on the first day with an ascent of Monte Pisano. The view overlooking the bay is worth the effort! Leonardo de Vinci is one of the most famous people from Tuscany. Follow in his footsteps by riding towards his native village. This is a rolling road with no major difficulty. * A day relaxing and visiting the Leonardo museum and villa. * Exploring the surrounding countryside with an unmissable col and fields of olive trees. 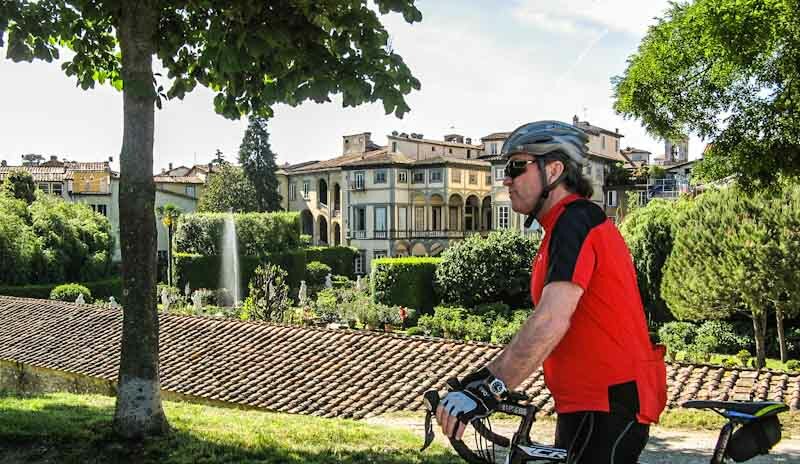 Return to Lucca along quiet and scenic rolling country roads with a few gentle hills. On the menu is a short circuit on gentle hills, riding between vines and forest, before visiting the historic city centre in the afternoon. With the café terraces, restaurants, local boutiques, museums, the Torre Guinigi, the walls... you will love exploring the backstreets. After breakfast, transfers to the station or Pisa airport.